The Manila Masters Tournament 2017 is starting soon and it is going to be one of the last big tournaments before the biggest one of the season: The International (TI7) 2017. As such it is the prime time for the participating teams to try out and practice their various favored strategies in a real tournament environment before unleashing them refined on their opponents at the TI7. The relative small pool of 8 teams does not lower the excitement for the tournament, as they are known names in the Dota 2 scene and big teams such as OG, EG, IG, Team Secret and Newbee and will surely excite us by their play. 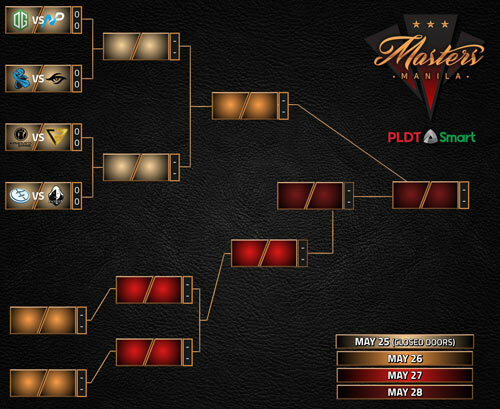 The Manila Masters will feature an Upper and Lower Bracket. All teams start in the upper bracket in the first round, the losers go to lower bracket and the winners move on. Thus every team has 2 chances to win the Manila Masters. All games are best-of-three except for the grand final which is best-of-five. The full schedule and results on one page here. Clutch Gamers: Armel, Gabbi, Rapy, Boombacs, flysolo. 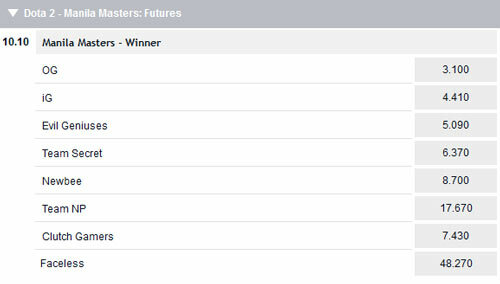 With the tournament approaching the esports betting sites will one by one put up odds before the Manila Masters will start. The first few are released, and as you can see bet365 ranks OG as the favorite to hold the trophy at the end. In addition, bet365 offers a lot of different bets. More information about the betting options here.